I just returned from a trip to New York City. I spent the weekend there, showing a group of my architecture students the city. We saw some of the greatest architecture in the world. We also saw a city gripped by paranoia. I lived in New York in the months immediately following 9/11, and while the city was far from normal at that time, people were moving forward with the indomitable strength of character that only a New Yorker can have. While the rest of America was still convulsing, New Yorkers were quietly going about rebuilding their lives. They were looking at rebuilding what was literally a smoking hole in the ground. (I remember it still smoking as late as February.) They did not cower in a corner; they faced the nightmare head on. The one thing I will always remember from my time in New York was that strength, that refusal to be bowed by horror. Strangely, I did not see that on this weekend, a bare week after the 10th anniversary. I saw police everywhere, barricades, and ultimately an intimation of fear that I never saw in 2001. After September 11, there were barricades all around Lower Manhattan, but the barricades served the purpose of keeping people from falling into the holes in the torn up streets or out of the buildings that hadn’t been checked for structural integrity. They were there to keep people safe in the most literal sense of the word. 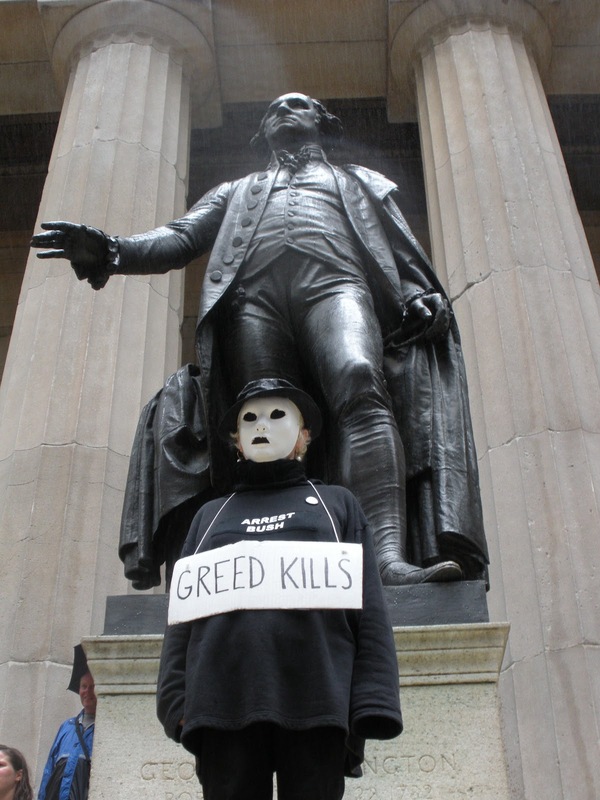 Now the barricades are back, but not to keep people from falling into gaping wounds in the earth, they now keep people from the statue of the Bull on the north end of Bowling Green, keep them from the steps of Federal Hall, keep them from walking freely, instead of like cattle on the way to the slaughter. I know there were protesters all over Lower Manhattan, and the U.N. Opening Session in Midtown, but those are normal September events. I have been taking students to New York City during September for the last several years, and I’ve never seen this before. The police are beating people in the streets, there are guards on every floor of the hotel, black motorcades moving through the city, security forces with guns visibly at the ready. Are we so afraid of protest and dissent in this city that we block all expression of it? Are the Masters of the Universe so frightened that they cannot allow anyone to express their American right of protest? The fear that I saw was not a fear in the general population, it was a fear OF the general population. As citizens we are de Facto terrorists, guilty until proven innocent. The very ideals which are the birthright of every one of us is under threat. I saw the protesters first hand, and if they are an existential threat to America, then so is the Tea Party. I say this, not out of any snarkiness, but as an actual point of fact. The signs I saw the protesters carrying could have been carried by either end of the political spectrum. In fact, the ends have bent discourse in this country so far around that the far left and the far right have become indistinguishable. I saw a sign saying, “End the Fed.” Very left, very right. Since I have not been watching the news lately, the only way that I could even determine the end of the spectrum protesting was from their appearance. I assume from the amount of dreadlocks, Rasta hats and Patchouli that the protesters were advocating from the left. Swap them out for a group of old white men, and you’d have a Tea Party Rally, you wouldn’t even have to change the signs. Apparently, on the ends, the only reference you have is context. That said, there was nothing frightening about the protesters, unless you are a billionaire oil tycoon, then perhaps visions of Paris circa 1793 or Moscow of 1918 might be running though your head. If you don’t believe in the freedom of speech, in the right to assemble, to ability to petition the government for redress, then what occurred this weekend in New York was a Fuselian scene of deepest nightmare. The flag no longer hangs from the New York Stock Exchange, and barricades don’t allow you to get within a couple of hundred feet of the place. In that one act, the financial barons that run the city showed their rejection of all that makes this country great. The fear that gripped the city this weekend was fear by the powerful of the powerless, which is a recipe for actual revolution. It becomes a self-fulfilling prophecy. I took this photograph in September 2008. And so it is that the land of the free has become a land of the feared. As a people we no longer believe in innocent until proven guilty, maybe we never did. Only holding it up as an unattainable ideal we said we followed to make ourselves feel better in comparison to those around the world who oppress more blatantly than our subtle form of "domestication" that makes us complacent, fat, and naive. Jefferson said "every generation needs a revolution," and I am not the first to quote him, but it is relevant now more than ever in an age of economic, social, and cultural decay. Those who have obtained real power are those who see nothing past their ledgers, and in doing so we have indoctrinated ourselves into believing that that is the best way of life achievable. Forgetting who we are, where we are from, and what we really want in life; we substitute our questions with another person's misguided, twisted and, crooked perspective of the world. Multinational corporate colonialism is the new form of despotism in a globalized world. A counter in the lobby of the US Dept. of Commerce used to measure population growth and a sign next to it read: "More people means more markets." When your government counts people in dollars and not in something of less abstract and superficial value, there is a very real problem. Is the Tea Party an Art Project? Is This the Best He Can Do?